This showstopper is truly an attention getting, dramatic and fantastical piece! Be ready for the looks of wonder, compliments and exclamations of “where did you get that? !” when you make your entrance! This fascinator/headpiece was inspired by the metal ship that forms the main focal point of the design. This ship sat on my grandmother’s knickknack shelf for many years and upon her passing, was given to me to keep as a memento or use in my work. I knew exactly what I wanted to use it for! 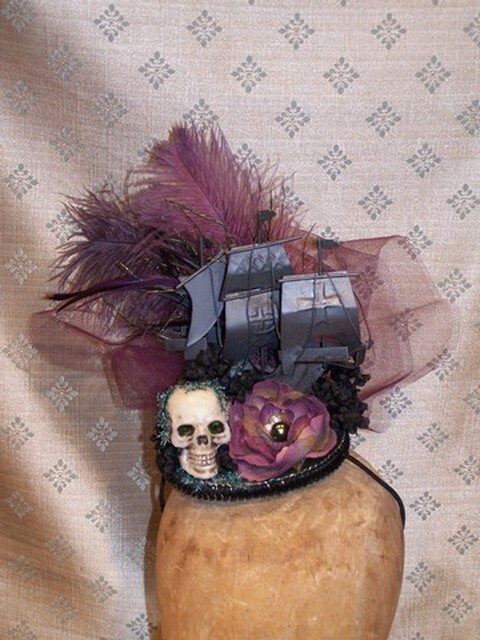 I had come across different versions of hats and fascinators with pirate themes using actual ships and wanted to try my hand at creating one but, with my own unique twist to it. The colour palette for this piece came about from the plum and deep green feather spray used. The ship was painted with a charcoal grey metal paint and the fascinator’s base covered in emerald green taffeta. The base has also been trimmed with a black and gold braid. A plum silk flower with cream and green pearls in its center sits beside a sepia faded skull draped in beaded “seaweed” with glittering Swarovski crystal eyes. A froth of complimentary toned tulle adds a final touch of drama and glamour to the finished design. The fascinator’s base is circular in shape, sits well on the head and is secured for the wearer by a strap of rounded elastic to be worn at the back of the head or under one’s chin. Awwww, isn’t she cute…..and just a little creepy! Another piece with Bombshell Revival Designs’ signature style stamped all over it – feminine with just a bit of creepy weirdness thrown in. I purchased this little dolly girl Halloween ornament at the end of the season this past fall and she has been hanging in my studio ever since just waiting for the right moment and idea to strike. I got tired of seeing her almost every day and wondering what to do with her sooooo…this past weekend I took her down off her hook and got serious about giving her purpose! The overall size of the ornament was right for a focal point on a hat but the three dimensional size of the head posed a problem for mounting it to the side of a hat base. As well, the smaller size of the body and feet did not allow for attaching it upright on a hat form or base. I decided to try laying it down and using it to make a fascinator instead of an actual hat and it worked. I chose a violet flower to compliment the black, cream and acid green palette of the ornament and it all started to come together. 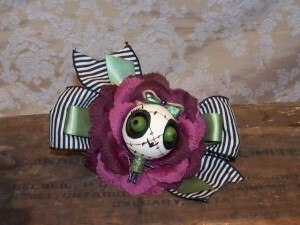 I decided to make this piece super girly by using bows and a center flower as the base for the fascinator. I chose one of my favourite ribbons – a wired black and cream stripe and then added a smaller ribbon bow in acid green satin for an extra element and further cohesion to the theme and colour scheme of the design. I did not add any veiling, tulle or feathers to keep the design clean, graphic and to ensure that focus remained on the ornament. My dead dolly had no mouth or eyelashes when purchased and although she looked fine without them, I decided to give her a bit more character with the added features. She also sports a saucy ribbon and jute bow in the center of her noggin to let her admirers know she’s always dressed to kill. 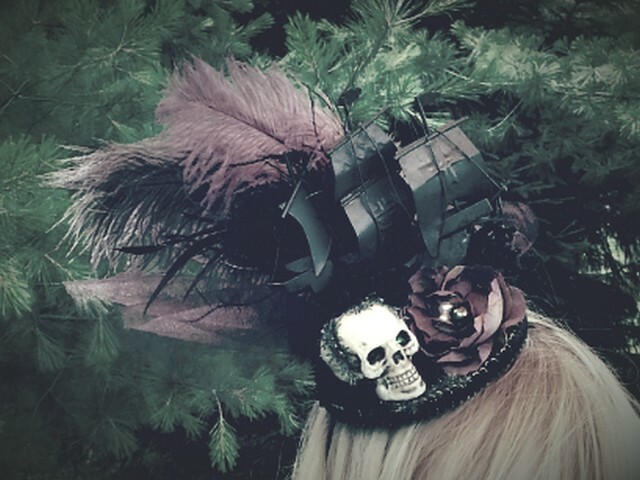 The fascinator has been finished with black felt on the underside and a medium sized, strong clip for ease of placement and security for the wearer. 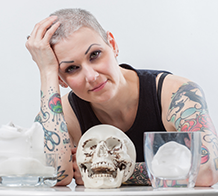 Dead Dolly is a fun and dramatic piece which is sure to elicit second looks, comments and hopefully some admiring glances. 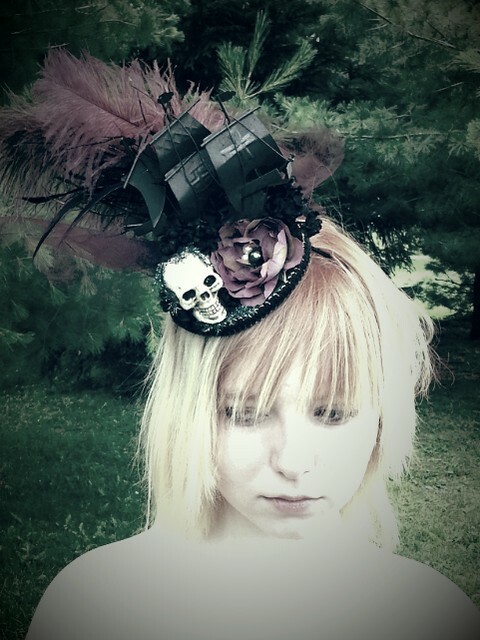 This is a second steampunk horror themed hat created by me after the successful reaction to and sale of my initial piece of this genre titled Elizabeth (June, 2012). This new hat is again based on the imagining of a post-apocalyptic world where abandoned and found objects have been used to create fashion and accessories for its survivors. It would be a strange new world indeed. 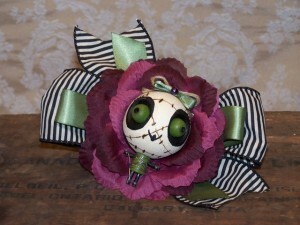 This piece also uses a doll’s face but with the addition of the doll’s arms as well. The hat form was covered with dark brown and plum silk fabrics and the same brown and plum tones were used throughout the piece in the tulle and ribbons. 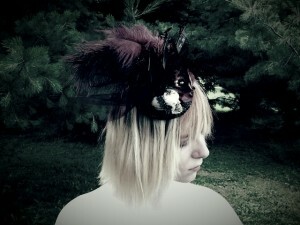 Acid green, rust and orange shades were also added to the colour palette in the hat band ribbon and the feathers. Some small hits of black were also used to ground and anchor the piece. Steampunk gears, screw head brads, found objects and the drinking/wetting tube from inside the doll’s body were used to solidify this piece’s theme and to embellish the hat and doll’s face. This hat has an elastic attached to be worn either under the wearer’s chin or behind at the base of the head.